Stop! Having good brakes is something we don’t notice…until we ride a motorcycle with sub-par stoppers. After a couple of years on a Triumph Street Triple R—a motorcycle with such powerful front brakes I made it a point to warn anyone riding my bike about them—the brakes on my 2000 Suzuki SV650 seemed so weak, flaccid and wooden I started wishing I had huge feet like Fred Flintstone so I could help them out. What to do? I had a 1999 SV650 back when it was almost new, but I didn’t remember the brakes being so bad. But I knew the 13-year-old Tokicos’ faults could be corrected by a caliper and master-cylinder rebuild, steel-braided lines and fresh pads and fluid—standard treatment for any used bike. So I called up Holeshot Performance (which specializes in SVs as well as many other bikes of all eras) to recommend lines. Dale “Holeshot” Walker, the roadracer/dragracer/performance junkie in charge, sent me a set of braided stainless Galfer lines for the front brakes ($95). The two-line kit (it eliminates the crossover and includes a longer banjo bolt for the master cylinder) is a perfect match for the naked or half-faired S model. He sells kits for all years of the SV. But before I bolted the lines on, I saw something really cool in a web-surfing session. 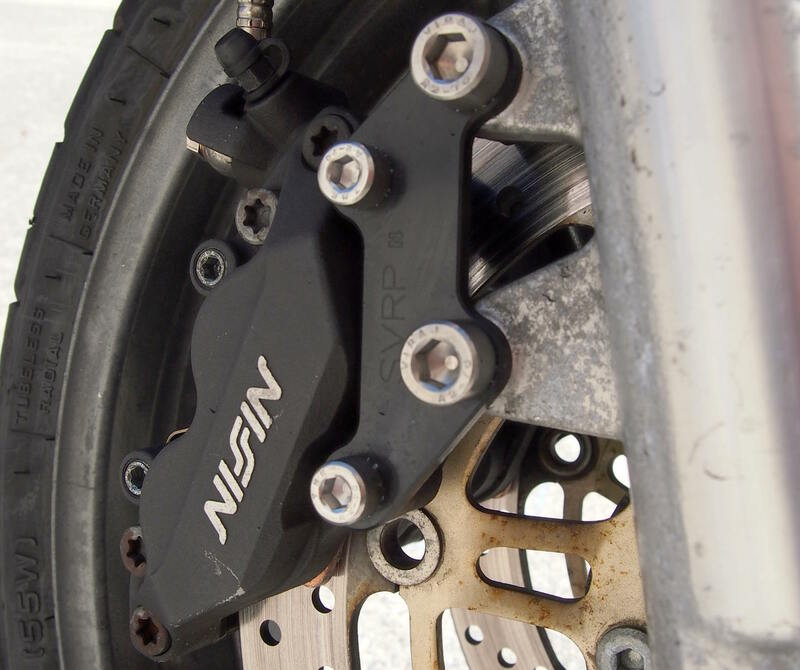 A guy was selling a V-Strom equipped with a set of adapter plates that allowed him to mount early-2000s four-piston calipers, vastly improving braking power with little addition of weight. The V-Strom and SV650 have a very similar fork/caliper combination—would it work for me? Yes! SV Racing Parts.com is just what it sounds like and offers a very cool product. 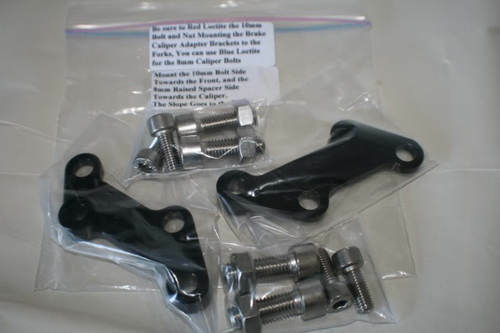 $75 gets you a set of nicely finished aluminum brackets and stainless-steel hardware ready to bolt up to your choice of either Tokico or Nissin calipers (there are also kits for the V-Strom 650 and 1000). The four-pot Tokico units in question lived on the front of the 200-2003 GSX-R600, the 2000-2003 GSX-R750, and all model years of the SV1000, according to SV Racing Parts. The Nissin equivalent was on just about every Honda sportbike from that era, including the F4, F4i, 929, 954, Superhawk, VFR800, RC-51 and even the first-generation CBR600RR. I went with the Nissin setup for several reasons. I figured they’d be easier to find, would have better parts availability, and would work with the stock master cylinder and brake lines. And I was right! I was able to find a complete front system for just $70 on eBay, but I’ll bet you could find a set for even less. And finding pads (I ordered EBC Double-H pads, about $40 a pair) and bolting everything up was less than an hour, including bleeding the fresh DOT-4 fluid the old-fashioned way. I took it easy on my first ride, as the directions that came with the pad advised me the pads could take up to 250 miles to bed in to the rotors. I could have thrown caution to the wind—right away, the difference in feel and power was stunning. Even without rebuilding the master cylinder and calipers, the brakes felt as strong and sensitive as I remember this generation of brakes feeling new. All in, these modifications would run you around $250 (you could save $100 using stock rubber lines and even more using bargain-bin pads)—is it worth it? Well, I love the confidence the new brakes give me, but I’m starting to think this series is headed towards the inevitable: the Big Swap. Swapping the front end from a Suzuki GSX-R or other sportbike will not only give me even better brakes (like the radial-mount four-piston calipers that were pretty much standard on all sportbikes by 2005), but superior suspension for a cost of about $500-750. But modifying the stock stuff lets me keep a stock appearance (like handlebars, headlight bracket and instruments) and is easier to do. I’ll see how far that approach gets me. Still to come: Suspension, tires, cosmetics, fueling and exhaust. The problem is the Suzuki oem pads are crap. Get DP hh pads and the difference is huge on the street or track. And to the writer if this story, if you can use the Honda, Nissin calipers from an RC51 then use the awesome oem Honda pads, not EBC’s. Having ridden only 76 years, including AMA dirt track, which by the way prohibited any brakes at the time on dirt track racing, what is all the fuss about brakes? My first big bike?? ?, a Royal Enfield 500 had one of the worst front brakes ever designed. Of all the bikes I’ve owned this was the only one that went faster when the front brake was applied. Any way in all my years of riding ( and still do at 82 ) I can’t remember any situation where I needed such wonderful things as disc brakes in regular day riding. Only when I road raced. Nope, never hit anyone or any thing. It’s called being aware of your situation when riding. Years ago we were told to avoid the front brakes as it would throw you over the bars. I Guess anti lock brakes might have been OK then, had they been invented. However in those days we weren’t riding over 1000 pound loaded Behemoths. In retrospect those bikes might benefit or really need from Disc brakes.. Sorry. You compare street riding from sixty years ago to today. Circa ’50s cages averaged about 100hp and weighed about double the current cage. Today soccer moms and housewives regularly drive (while texting, talking, and net surfing) 400hp 8-speed automatic ABS and CPU-gyro-controlled SUVs weighing several tons. Radial tires and xenon bulbs didn’t even exist back then. Since ten years ago Porsche Turbo Carrerra automatically feathers the brakes before you touch the pedal when the CPU senses emergency stop when the driver lets quickly off the throttle. You’d have a heart attack if you saw a 6″ wide motorcycle wheel. Production motorcycles make almost 200 hp. Comparing motorcycle stopping requirements sixty years ago to today is epic fail, sorry. Re. your many years of motorcycle riding experience: White Star Lines (wrongly) chose Capt. Smith for the maiden Titanic voyage because he had over 30 years sailing experience without a major accident. (BTW, this was scheduled to be Smith’s last voyage prior to retiring…one of many strange Titanic facts.) Smith, being over confident, did indeed cancel the allegedly unnecessary Sunday lifeboat drill because he was having so much fun signing autographs at Sunday religious service. They hired exactly the wrong guy. If they hired someone with at least some tragic experience, he would have been more likely to take every precaution. How any one could possibly minimize the advantage of better brakes is beyond me. A 3mph sudden deceleration head impact can be fatal. Soccer Moms driving SUVs that weight several tons?? ?My Honda SUV is a wee bit over one ton. Get real. Our brakes are better now than they ever were in the Good Ole Days. Bikes, cars, airplanes included. Not only have I ridden bikes for over 60 years, but I have been active in aviation for over 50 years,( 12,600 hours) including instruction, qualified for aerobatic shows, crop spraying and a Federal NTSB aircraft accident investigator. What on earth does a ship captain have to do with anything? Us old timers are responsible for many of the improvements and technology that we all enjoy today. What is your track record..?? Oh, dealing with those older cars with mechanical brakes was not exactly fun. And the roads were certainly more challenging. never underestimate the “soccer mom in mini-vans contingent”… they don’t give a rat’s. …err, John, your math is off. 1 US ton =2000 lbs. A Honda accord comes in over 3000lbs, typical minivans are approaching 4000 lbs. A ford F150 in 4×4 mode is 5000 lbs. A toyota sequoia is a tank of gas short of 6000lbs. If you want to see a 2000lb car try finding a current series Lotus Elise. If your brakes are just spongy, there is a free way to improve the feel and you don’t have to bleed a drop of fluid – in fact with ABS systems, it’s better if you don’t. Using a tire lever or wide bladed screw driver, you can lever the pads / pistons apart in the caliper and force the brake fluid back into the master cylinder. If you can do this quickly enough, it will take the air bubbles with it. Sometimes you have to take the caliper off the mount and pump the pads together first. Remember to pump the pads back against the disc before using and try not to gouge up the pad or disc when doing this. A year ago I sold my 2006 SV650, and now I find myself saying that my next bike will almost certainly be something just like it. Great motor, fantastic frame, really a fun bike for the real world. One thought on improving the front end: Ricor makes a product called “The Intiminator”. Weird name, but it gets good reviews. They are kind of similar to Race Tech’s Gold Valve Emulators in that the job is to improve damping rod forks, but they don’t require any drilling and are much easier to install. Pretty much plug-n-play. I can’t personally vouch for them, but when I had my SV they were on the list of improvements I wanted to try. I’d still love to hear your impression of them if you check them out. I have a 2006 SV650N and I upgraded to the Tokico 4 pots and the SV Racing adapters. Also added Galfer stainless lines. After the wave washers on the oem rotors disintegrated at a track day, I upgraded to some Galfer wave rotors. To top it off, I added a Brembo RCS 19×20 master cylinder. Stopping is not a problem. For suspension, I shipped the front forks off to Traxxion Dynamics and had them install some AK-20 cartridges. For the rear, I had them send me a Penske 8983 after providing them with my weight and riding style. For exhaust, I had M4 ship me a full system and paired that with a Power Commander. Recently added a Scotts steering damper, CRG Hindsight mirrors and a CRG clutch lever. Currently have a set of Metzeler Sportec M5 tires on my ride and have worn the elephants off the edges. I also highly recommend the Michelin Power Pures. I’ll be 60 next year and I think I will reward myself with a new Sargent seat. Don’t let anyone sway you from fixing up your SV. I get a big smile every time I head out to the hill country around San Antonio. Don’t forget to consider a more direct solution for the suspension up front – RaceTech, for about $400 door-to-door you get an amazing new set of pogo sticks. I love what they did for me on my 2002 SV650 track bike. Good luck, I look forward to the next installment! For a so much loved machine like the SV650 this post is awfully dry on comments…. I understand that you want to improve the machine spirit on any front you can but doesn’t it somehow goes against the core spirit of the machine to do this upgrades? I mean if you want that amount of bite, or amazingly better suspensions…. isn’t the stock engine to fall short a bit? If you improve that also haven’t you already start to step on GSXR land? Simple doesn’t have to mean cheap–and the stock brakes are simple and useable, but cheap, and for not a lot of money, I can improve them and increase the pleasure I feel when I ride my bike–it’s hardly trying to change the bike into something it’s not. There’s nothing wrong with the stock SV-650 engine. The suspension and front brakes are bargain-basement-performers from the late 1970s, in my opinion, and it’s where the Suzuki factory pinched pennies. Better tires are worth it, too. I used Michelin Pilot Powers. The stock Dunlops felt stiff, as if they were made for a bike weighing a lot more than the SV-650. Once you bring those areas up a couple of decades and to work as well as the engine, it becomes a better bike and more enjoyable to ride. How? THe engine is the part of the bike that makes all of the other upgrades worthwhile. Remember, the Ducati 916 was by far the slowest bike in it’s class (by 20-40hp) and nobody cared because of the engine and chassis’ character. A: no, the gulf between “SV land” and “GSXR land” is vast. can’t get there by walking. you’ll need a plane ticket. Unless you are racing or participating in track days, why do you feel the need for two rotors? I am a 73 year young guy who has never owned a bike with two front rotors. GB500, HawkGT, VX800, DR650, MZ Skorpion Tour, etc., have all worked well for me riding conservatively aggressive solo and two-up on the street. Plus I like the simplicity and lighter weight of one rotor. EBC HH sintered pads seem to work well enough on stainless disks wet or dry. I remember Two Bros Racing successfully campaigning a HawkGT with a single front rotor. They said they did not feel the need for two. Now most new bikes come with two. You can’t impress the ladies simply riding up to the stoplight, you have to do a reverse wheelie or they’ll just never get laid. 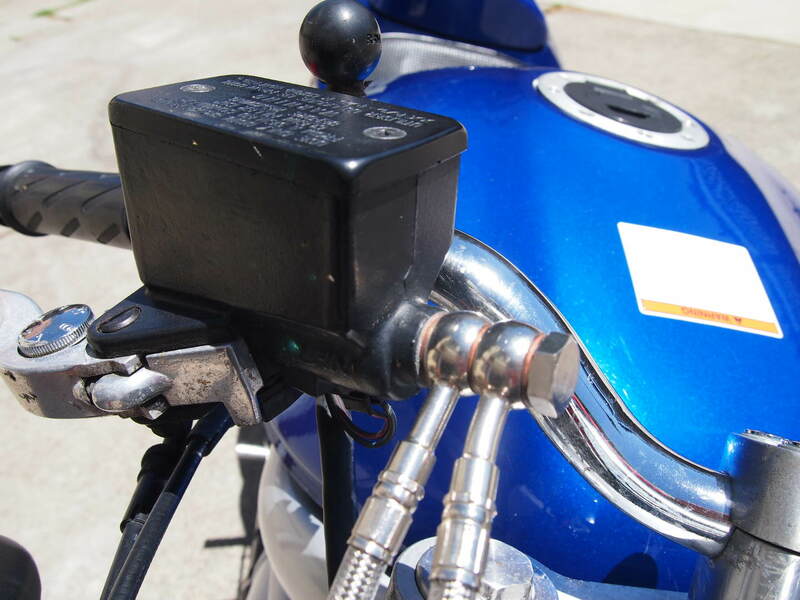 All I did on our 2000 sv650 for brakes was new pads and SS braided lines – that alone was a huge improvement for < $100. It won't get you one-finger-stoppies, but the increase in feel and ability to modulate them better was good enough that I don't feel the need to change the calipers. Yeah, I did that on my last SV, but this was just such a cool modification I had to do it! I did the same thing as Christian A on my 2002 SV650 that is used as a dedicated track bike and found it a more than adequate solution. I look forward to seeing how the brackets hold up as the pads bed in and under hard braking. My thoughts lean toward flexing parts that could cause drag or binding. But so far so good, Gabe. I’m sure stoppies are an easy matter now. I’ve got the brackets and Tokico calipers on my VStrom 1000. If they don’t flex under that heavy beast – and they don’t – they won’t flex under an SV650. Very worthwhile mod along with the braided lines and HH pads. I’ve had one of the SVRP kits (with ’02 GSXR calipers) on my ’04 650 V-Strom for about 30k miles now. The difference from stock was nothing short of amazing. Blair’s customer service is top notch, as well. I know this flies in the face of Interwebs forum consensus, but don’t do the inverted fork swap. Swap out the fork tubes with CBR600F4 jobbers, and install a RaceTech Gold Valve upgraded set of F4 fork guts w. appropriate springs. You will gain external rebound and preload adjustment, maintain your stock appearance and handling dynamics (flex and geometry), and spend less money. Why not just do the whole F4 front end? That works too, but the guts swap is easier and cheaper. Plus the F4 wheel is 3.5″ and IMO isn’t a good match to the stock SV rear. If you’re going to put a 5.5″ rear on (not a terrible mod for tire choice options expansion, but not a handling benefit) it works better. Also now that I think about it you don’t need the tubes, just the guts. I honestly don’t remember the exact details as I had it done years ago, but I’ll see if I can find my notes from back then. I know for sure it was F4 guts and caps in any case. F4 fork upgrade not happening without swapping triples. SV is 41mm vs. F4 43mm. There’s a lot of variance between the proposed Nissin calipers here. SuperHawk and earlier 900RR calipers are an earlier generation with different pads than later F4i, 929, 954, RC51 clamps. Among the latter, piston sizes changed between year and model; -which will effect lever effort. VFR parts were designed around Honda’s linked braking system and are right out unless you like plumbing experiments. Ya my memory is not serving me well…I think it may have been F3 guts only? I replied above before I saw this post. I’m going to try to find my notes and post up…it worked great though, and used the stock SV lower legs, so obviously wasn’t F4 43mm tubes. Sorry for the mis-information. It was probably F3, quite a few Hawk GT owners have made this mod. I had a 2006 svs with inverted forks from gsxr 1000. Great brakes. One time when riding back roads came up on crossroad and stop sign for me, cross traffic NO STOP. I was not paying close attention at the time and just realized, can I stop or should I just go threw it. Split second decision and hit the brakes. Unreal, how much stopping power. I was probably going at least sixty. One thing about braking, practice panic stops, use the front brake. Lot of fellas don’t practice and then when emergency hit the rear brake and it could be highside time. When I owned a 2007 SV-650K7, I did exactly this modification because I, too, had gotten used to 4-piston calipered sport bikes. With the 4-piston Nissins, Ohlins rear shock, and Race Tech Cartridge Emulators in the forks, it was a very fun sport bike. The calipers I used were Tokicos from a 2000-2003 GSXR-750.